The pepper mill is one of the most basic and indispensable kitchen tools needed in home and commercial kitchens. The depth of flavor and pureness of freshly ground pepper does not compare to the pre-packed ground varieties available for purchase in food stores. Pepper mills are used to prepare food during the cooking process and as added seasoning for tabletops at time of food serving. Pepper mills come is a host of sizes and colors, but more importantly, the grinding mechanism really determines the size of the pepper flake or dust. The handle and ease of operation is important because the pepper mill gets used daily multiple times by multiple members of the family with different gripping strength. For truly effortless grinding consider a battery operated pepper mill. Below are our recommended picks. The stylish and sophisticated Derwent Precision Gourmet Pepper Mill, offered by Cole & Mason is a great addition to any kitchen and a powerful kitchen tool. Complementing any kitchen color scheme with its clear high gloss acrylic body and stainless steel accents the pepper mill is both stylish and functional. The grinding mechanism for the pepper mill is made of a hardened carbon steel and can be adjusted six sizes from various degrees of fine to coarse shavings. Standing tall at 7 ½” in height the pepper mill is easy to spot and handle in the kitchen. The companion salt mill is also available from the same manufacturer, Cole & Mason, and in the same style completing this dynamic duo kitchen set. The salt mill mechanism is made of ceramic for the ultimate salt dusting. Maintenance: To clean, hand wash with a cloth washer. Do not submerge in water or place in dishwasher. Cook’s Illustrated is a well-known highly respected magazine that routinely evaluates kitchen equipment and shares its findings with its readers. 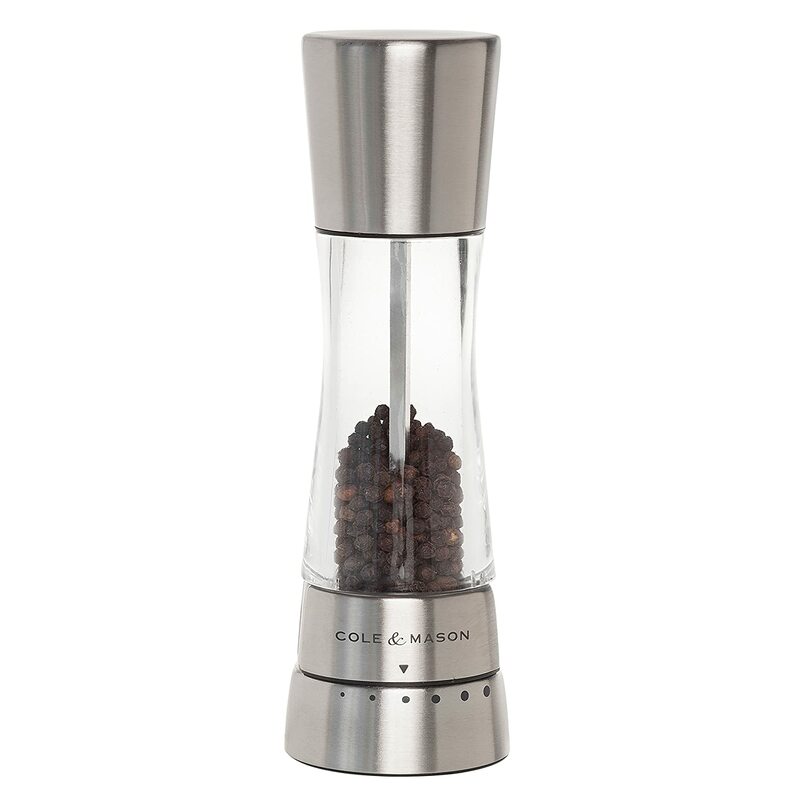 When examining and testing pepper mills for an article published in the magazine, the Cole & Mason Precision Gourmet Pepper Mill came in at the top of the list as the best in the pepper mill category. It is all in the grinding. The grinding mechanism transforms the peppercorn into pepper flakes of varying sizes. In the featured pepper mill, the peppercorns are stripped down one layer at a time using the advanced, machine cut, hardened carbon steel mechanism found in this pepper mill. The stripped layers combine for the purest fullest release of the freshest peppercorn flavor enhancing the taste of the pepper and accompanying food. So confident is the manufacture with the pepper mill’s grinding mechanism, that the grinding mechanism is guaranteed for life. The salt mill mechanism is made from ceramic, making diamond cuts of salt products. From dust to flake, the peppercorns are consistently ground in one of six settings ranging in degrees from dust to fine to medium to coarse as set by the cook or diner. The settings adjust easily by turning the ring located at the base of the pepper mill until the right setting is chosen. The salt mill has three grinding settings. The spring load mechanism in the grinding mechanism makes it easy to change the settings on the pepper mill. The pepper mill is durable and easy to use. Simply turn the handle and the grinding mechanism is instantly activated. Refilling the pepper mill is simple because the removable lid can be opened and closed without difficulty. The clear body of the pepper mill enables user to monitor peppercorn levels and add more peppercorns when the supply is low. To maintain, hand wash the pepper mill and wipe the outside of it with cloth or soft towel. Do not use an abrasive sponge or stringy sponge as the hard elements may cause the acrylic body of the pepper mill to scratch. Also, do not submerge in water or place inside dishwasher. The inside mechanism is steel and can corrode with water. After continued and prolonged use, the paint used to mark the grinder settings on the pepper mill wears off making it difficult to select the correct setting. The black dots wear off. Try marking them with a permanent marker pen if you notice the dots begin to wear off. Selecting the correct setting will be difficult and may ruin the flavor of the food you are preparing. Since 2014, however, the manufacturer began using acid etched dots to mark the grind settings and this feature has become a standard on all Cole & Mason products. Make sure that the grinder is set to the correct setting. If the grinder level is set between settings, the pepper shavings are inconsistent. Sometimes the dust setting appears fine or the medium setting is coarse. To ensure that the setting you desire is the setting the pepper mill is set to, test the pepper mill on a paper towel prior to using it on food. The pepper mill should be stored in a shady dry place in your kitchen. Keep the pepper mill away from direct sunlight. Direct sunlight diminishes the flavor of the spices. Because the body of the pepper mill is clear, there is no barrier between peppercorns and the rays of the sun. Through time, the rays of the sun chip away at the taste and quality of the peppercorns inside the pepper mill. Customers complained that the salt mill top on older models, manufactured prior to 2014, easily broke, rendering the salt mill useless. Since 2014, Cole & Mason has made improvements to the salt mill tops to address the broken tops problems reported by customers. Made of a more sturdy and durable material, the salt mill top is breaking less. 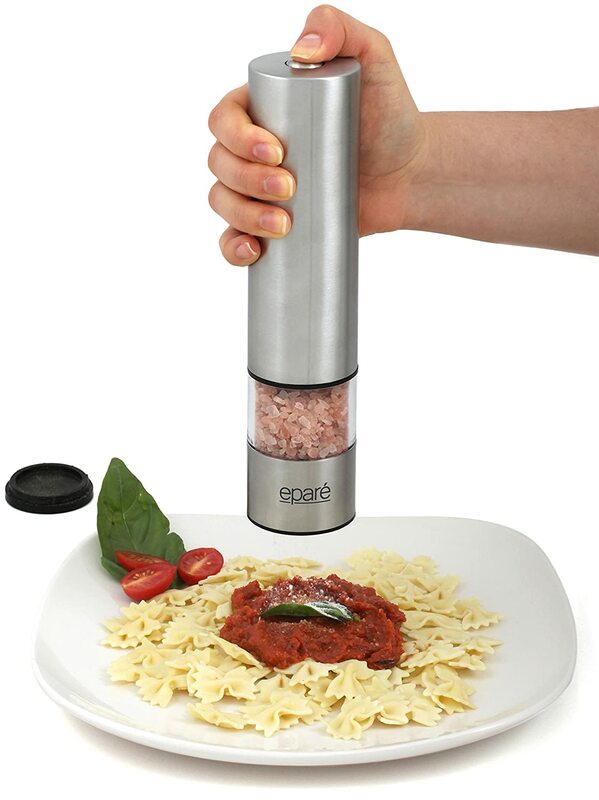 Grind salt, pepper or spice with one hand using the Eparé Battery Operated Salt or Pepper Mill and Grinder. With the push of a button automatically launch the grinding mechanism to produce consistent and evenly shaped salt, pepper, or spice shavings. The LED light at the base of the pepper mill provides illumination of the area you wish to sprinkle. A cap storage tray at the base of the pepper mill allows for the hassle free collection of unused salt, pepper, or spice flakes so that it can go on food and not your countertop. The mill and grinder can make dust to flakes of salt, peppercorns, and a variety of dried spices in an assortment of sizes. Particularly with salt, the mill and grinder can grind sea, kosher, or Himalayan salt in different levels of coarseness. From fine to coarse, the settings are adjustable to the preferred size. The mill and grinder features a sleek and modern design with a window to view the contents of the mill and grinder and the level of the salt, pepper, or spice in the holding tray to signal when a refill is necessary. The storage window or tray is clear. To refill, lift the tray and add salt, pepper, or spice as desired. The mill and grinder contains an upside down cup, called a cap by the manufacturer, located at the base of it that collects the ground salt, pepper, or spice for later use. Gravity causes any ground salt, pepper, or spice in the mill and grinder to fall down often sprinkling countertops with the remains of the item just grinded. The cap collects these shavings and temporary holds them for later use, keeping countertops neat and clean. The featured mill and grinder only works with battery power. If the batteries die out and you do not have replacement batteries at home, you cannot use the mill and grinder until you replace the dead batteries. Make sure you keep a backup pack of batteries handy in the kitchen in the event the batteries die out while you are preparing your meals. In order to replace the batteries or refill the inventory tray with salt, pepper, or spices the mill and grinder must be taken apart. The product manual that accompanies the mill and grinder explains how to replace the batteries and refill the inventory tray. The theory however is much easier to comprehend than the practice. Particularly difficult is refilling the inventory tray. Try using a small spoon or small funnel or risk rolling peppercorns on your countertops. The LED light bulb at the base of the mill and grinder is not replaceable. Once the light bulb burns out, the entire mill and grinder must be replaced to use the light feature. If your mill and grinder are still protected under the limited liability warranty, the manufacturer will replace the mill and grinder under the limited warranty program. The Magnum Plus Pepper Mill 9” Black is the top dog of the Unicorn pepper mill offerings. Not for the faint of heart, this towering pepper mill, is a favorite of pepper aficionados. The best feature of this pepper mill is the storage tray. The pepper mill can hold one and one quarter cups of peppercorns. Ideal for use in busy and commercial kitchens, this pepper mill is available in black ABS plastic and contains “superior” steel grinding mechanism. The height of the pepper mill makes it easy to find and operate with minimal turning and optimal ground pepper shavings. The grinder settings are easily adjustable and are set by turning the bottom thumbscrew located at the base of the pepper mill until the desired coarseness setting is selected. Grinds are plentiful and consistent in amount from medium fine to extra coarse. The large storage tray on the Magnum Plus is great for heavy pepper users and people who do not like refilling their pepper mills. The storage tray holds up to one and one quarter cups of peppercorns making it a must use kitchen tool for cooking and freshly ground pepper enthusiasts. The pepper mill is easy to use. Simply turn the pepper mill until the desired amount of pepper is added to your food. The large size, over nine inches tall, makes it easy to grip and use comfortable. Users report it needs less force or turns to operate and produces a good amount of fresh pepper. The pepper mill is very easy to refill. While the large storage tray means it takes longer to use up all of the peppercorns when grinding, when the pepper mill needs to be refilled with peppercorns, simply twist the cover located at the top of the pepper mill and add the peppercorns through the storage tray door. The pepper mill is clean in no time. After use, apply glass cleaner to the exterior body of the pepper mill and then wipe clean with a cloth. Do not use glass cleaner in the inside compartment or inventory tray of the pepper mill – the “superiors” steel may rust if not dried properly or is submerged in water. An added benefit to the large storage tray is that the door that opens the storage compartment opens wide. This makes it easy to refill but if you do not pay attention when refilling storage tray, the peppercorns will spill out of the storage tray just as easily as it was refilled. The featured Unicorn pepper mill is a bit outdated with none of the pizazz that surrounds kitchen tools and gadgets. The pepper mill is made of black ABS plastic. Completely uninspiring, the pepper mill’s color and material makes it stand out like a sore thumb in the kitchen. There is no salt mill or shaker companion and no tray to hold the pepper mill when it is at rest. The functionality far outweighs the pepper mill’s style. OXO products are well known for their non-slip gripping material. The Good Grips Lewis Pepper Mill continues that design style by presenting a non-slip knob to turn in order to activate the grinding mechanism of this basic pepper mill. This value buy sacrifices appearance for basic functionality. The grinding mechanism is made of ceramic producing consistent pepper flakes from fine to coarse levels. The rest of the kitchen tool is made of plastic, that over time looks dated and inexpensive. Only available in white, the style features spiral downward fast. For a basic tool at an inexpensive price point it is one of the best models available in the budget category. Maintenance: Use damp cloth on outside of grinder to clean. Do not wet or submerge pepper mill in water. OXO products are known for their non-slip material in the area of the kitchen tool that is gripped to make it function. In the featured budget pepper mill, the non-slip material is added to the knob on the kitchen tool’s arm. The ceramic grinder is activated by turning the knob. When ready to use turn the knob in a clockwise direction to convert the peppercorns into pepper flakes. 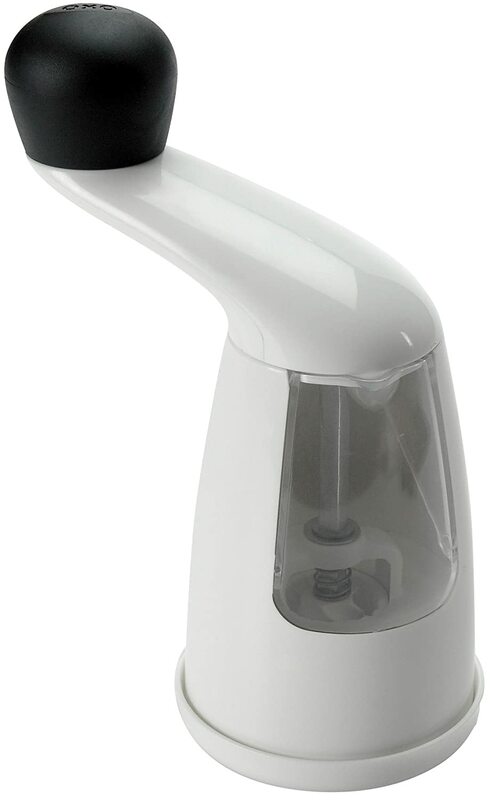 The long arm and non-slip grip material make the Good Grips Pepper Mill easy to hold, grip and turn to operate. The nonslip and easy grip material makes the operation of the pepper mill safe and comfortable for all members of the family. A cross section of grind settings are available with this pepper mill. From fine to coarse, select the setting desired by adjusting the kitchen tool’s settings to produce the desired grind. The ceramic grinding mechanism makes good cuts that keep the size of the grind consistent. Ceramic mill grinding mechanism will not rust or corrode, particularly if steam from cooking gets into the pepper mill. Set coarseness level from fine to coarse as needed. Maintenance and upkeep is part of kitchen life. When you run out of the peppercorn batch included with purchase, it will be time to refill the inventory tray. The inventory tray door is clear. The clear color allows the pepper mill operator to verify he or she is added the correct item to his or her food and monitors the peppercorn levels to refill when empty. The inventory tray door opens wide and is easy to refill without fear of spilling the peppercorns. While not very stylish, you cannot beat price for basic functionality offered. OXO pepper mill purchasers rave that it last for years. Add spices, peppercorns, or salt – the pepper mill can grind any of these items well. On the flip side, when the pepper mill is ready to retire, it falls apart quickly and swiftly. Many fans of the pepper mill simply purchase a replacement pepper mill. The pepper mill is made entirely of plastic. Especially inside the pepper mill it takes days to fully dry. Whether filled with salt, peppercorns, or spices, the material to grind must start off dry to effectively operate. Medium to coarse grinds are easier to produce utilizing the featured pepper mill. For a fine grind, you must turn the knob a great deal for a spec of pepper dust. Be careful opening and closing the inventory tray door. While the clear color allows the user to monitor content levels, if opened with too much force the inventory tray door tends to break or in not closed properly, the inventory door opens up spilling all the pepper mill contents. The OXO Good Grips Lewis Pepper Mill is only made in white plastic. The kitchen tool is unattractive and through time looks inexpensive. Especially in new or updated kitchens with stainless steel appliance, the pepper mill looks out of place with many kitchen styles and designs. Pepper mills are a necessity for any pepper connoisseur who wants to enjoy the bold flavor of freshly ground peppercorns. Determine the features that are important to you like grip, ease of use, and height. Understand how to refill the pepper mill and how it grinds peppercorns or spices to produce the level of coarseness desired. Try the different settings to learn how to operate the pepper mill for different cooking methods and techniques. Remember to clean and store in a cool dry place to keep your peppercorns and spices as fresh as possible.